To help promote tomorrow’s National Pancake Day, Ric Rush and the rest of the 103.5 WEZL crew took their Kindness Crews-aide with Crews Chevrolet to the IHOP in North Charleston where they bought everyones breakfast. Watch the video here. 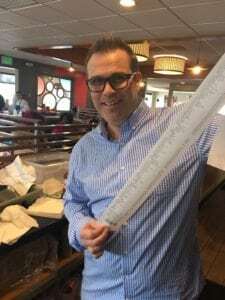 Ric and his team have been spreading kindness around the lowcountry and today they did so at IHOP in hopes of bringing awareness to Na tional Pancake day where you can receive a stack of free pancakes at IHOP on Tuesday, March 7th. In return, you will be asked to donate to your local Children’s Miracle Network Hospital. All participating locations in the Charleston area will be fundraising for the MUSC Shawn Jenkins Children’s Hospital. Visit your local IHOP tomorrow and make a difference by donating. Continue spreading kindness around the Charleston area. For more information about National Pancake Day go to https://www.ihop.com/national-pancake-day.